Your Card, On Your Terms! Download CardValet! Put fraud control in your pocket by downloading CardValet, a powerful and easy app for your smartphone, attached to your Nymeo VISA® Debit Card and/or Credit Card! CardValet is a mobile app that will let you monitor your Nymeo VISA® Debit Card or Credit Card usage and spending on-the-go. Manage when, where and how your card is used. A lost or stolen card is just one area of concern in today’s world where identity theft, skimming and other attacks are an unfortunate reality. Turning your Nymeo VISA® Debit Card or Credit Card off when you’re not using it helps safeguard against fraud. When your card is “off,” no withdrawals or purchases will be approved. Transaction controls allow your card to work only in specific locations or geographic areas, add another layer of protection, and real-time alerts keep you informed when your card is used or declined. View real-time balances as well as transactions related to your Nymeo VISA® Debit Card or Credit Card. Transactions include pending, posted and denied, plus merchant name and dollar amount. Tag or add memos to your transactions. CardValet can alert and restrict PIN and signature transactions for Nymeo VISA® Debit Card or Credit Card, allowing you to manage, track, and report specific types of transactions and quickly detect unauthorized activity. Customize your experience by choosing from a variety of options. Do not disturb settings let you specify a window of time for alerts, messages and other notifications. Spending limits can be established to allow transactions up to a certain dollar value and decline transactions when amounts exceed pre-defined thresholds. Transactions can be monitored or controlled for specific merchant categories such as gas, hotel, travel, restaurants and grocery or retail stores. You can also establish these controls by location. The flexible app lets you change these parameters anytime with ease via your smart phone. Going on vacation? Holiday shopping? Simply update your transaction controls to fit your spending needs. When the Nymeo VISA® Debit Card or Credit Card is ON, transactions are allowed in accordance with your usage control settings. When the Nymeo VISA® Debit Card or Credit Card is OFF, no purchases or withdrawals are approved until the card is subsequently turned back ON. This tool can be used to disable a lost or stolen card. The My Location control can restrict transactions to merchants located within a certain range of your location (using the smart phone’s GPS); transactions requested outside of the specified range can be declined The My Region control uses city, state, country or zip code on an expandable interactive map; transactions requested by merchants outside of a specific region can be declined. Alerts can also be set up to inform you of specific types of transactions or location-based activity. CardValet can send an alert when a Nymeo VISA® Debit Card or Credit Card is used, used in a specific region or at a certain merchant type, when a transaction is approved and exceeds any of the permitted use policies, or when a card transaction has been attempted but is declined. The alert is sent in real-time, immediately after the transaction has taken place or has been declined. Please note that you will still need to contact Nymeo if you are traveling out of the country in order for you to use your card. This is an added security measure for your protection. 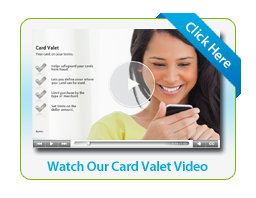 Download this powerful app to your Apple iOS or Google Android smart phone by searching for "CardValet" then customize usage settings and alert preferences. If you have questions, contact a Nymeo Financial Concierge at 1-855-436-4100 or info@nymeo.org. Note: You will need to establish separate users for your cards.